A repeating original crossed window pane design marches around the boarder of the LANCASTER coffee table/firepit table top. 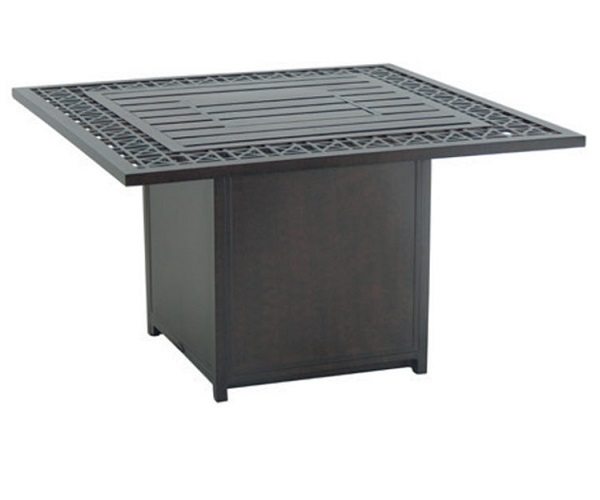 A decorative aluminum slat design completes the table top with the base firepit box featuring flat aluminum detailing. Constructed of quality aluminum and designed with an aluminum top and base to coordinate with the LANCASTER Collection, the LP gas compatible coffee table/firepit completes any outdoor living area with warmth and ambiance. Square Fire Pit Coffee Table 38" x 38"